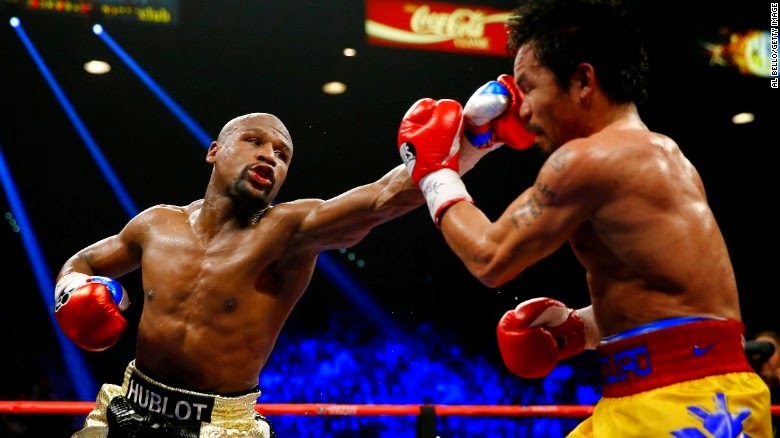 Mayweather vs. Pacquiao: the uber-bout that wasn’t. The so-called fight of the century was pay-per-snooze, a complete waste of everyone’s time and money — except in a boxing community now rolling in obscene amounts of cash, surely in disbelief they fooled us rubes again. The six years that had passed since Floyd Mayweather and Manny Pacquiao should have originally fought might have built the anticipation for Saturday night, but it actually robbed us the possibility of a fight that might live up to the hype. Pacquiao was an old 36, with a pedestrian 3-2 record in his last five bouts entering the Mayweather fight. He faced a size disadvantage that even brilliant footwork couldn’t help. Mayweather was the hype machine. The money man. He’s the straw that stirs the drink, if you will. The Las Vegas millionaire was the undefeated champion at 47-0 and looking to break Rocky Marciano’s record of 49-0. He was everything a boxing star should be, with all the charisma and magnetism we expect from stars of the sweetest science. Floyd’s problem: He has none of the likability. ut we ignored all this because we wanted the fight to be something greater than it was. We attached meaning to it when this was clearly a payout fight, at best. (Floyd even admitted as much.) Oh, they wanted to win, but this hardly evoked the memories of Ali, Frazier, Foreman, Sugar Ray, The Hitman and Hagler fighting brawls that would land them in hospitals for belts that defined them as athletes. This was just glorified sparring. The hype grew so big that some of the greatest minds in boxing convinced themselves that things would be different. That Manny’s reach would suddenly grew longer. That Floyd wouldn’t throw love-taps for most of the fight, content to play defense and let one or two power punches give him rounds. They thought that the “whoosh” made by Pacquiao’s missed punches and the crowd noise that followed would fool us into thinking this was a real bout, not robbery with the press of a PPV button. They were selling a lie and we were all too happy to buy into it. You can only fool people so long. By the third round, it was clear Mayweather was going to be successful in playing defense for nine more rounds. By the seventh, it was obvious Pacquiao wasn’t going to be able to get him down. The announcement that Mayweather was the victor was an inevitability. Pacquiao was the loser, but he had company. All of us were too. Most had watched the classic end to the Spurs-Clippers Game 7 before flipping over to the fight. It had action, unpredictability and “did you see that? !” moments. Basically it was the exact opposite of Mayweather-Pacquiao. Oh, and it didn’t cost $99.95.